I used a two-octave drop and some good ol' crunchy distortion for the bass line on this one. Sometimes I wish I had the vocal range that men have because it would really come in handy at times! Even though my main inspiration was taiko drums it took on a Radiohead Myxomatosis feel. Also, I don't know if I should be saying this out loud but, I finally listened to Lady Gaga's The Fame album yesterday (the rock I live under is beautiful) and there is a song where she does the Taiko yell just like I did in this song. For the record, I had no idea! Anyway... this song is for Morrissey's superfan Russell Brand because a) I can just imagine him saying some random girl-fact like this off the top of his head, can't you??? 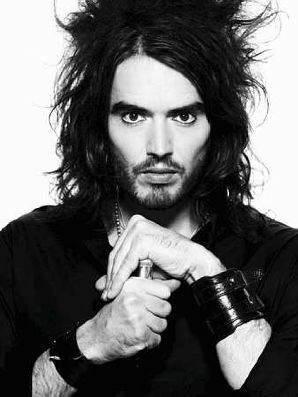 and b) both Morrissey and Russell Brand operate on some other witty and unique plane of consciousness that I don't fully understand but greatly admire. Granted, Russell's brain synapses are firing at warp-factor nine- or maybe he just talks faster that Morrissey? I don't know. Whatever! you blow me away every. single. time!